You must configure the available bandwidth for incoming and outgoing traffic, for each interface on your Smoothwall that you want to shape. It is recommended that you configure slightly less than the expected maximum throughput of that interface to be certain of avoiding packet queues. Typically, this would be 95% of the expected maximum. 1. Go to Bandwidth > Control > Interfaces. 2. Click Add new interface limit. 3. Ensure Enabled is selected. 4. From the Interface drop down list, select the relevant external interface. 5. Configure the appropriate amount of incoming and outgoing bandwidth for this interface. You can choose to configure the bandwidth as kilobits per second (kbps), or megabits per second (Mbps). To change this, click Edit. For a detailed description of how to share available bandwidth between classes, see Configuring Bandwidth Interfaces. 2. Highlight the relevant interface within the Interfaces table, and click Edit. 3. Edit the configuration as required. 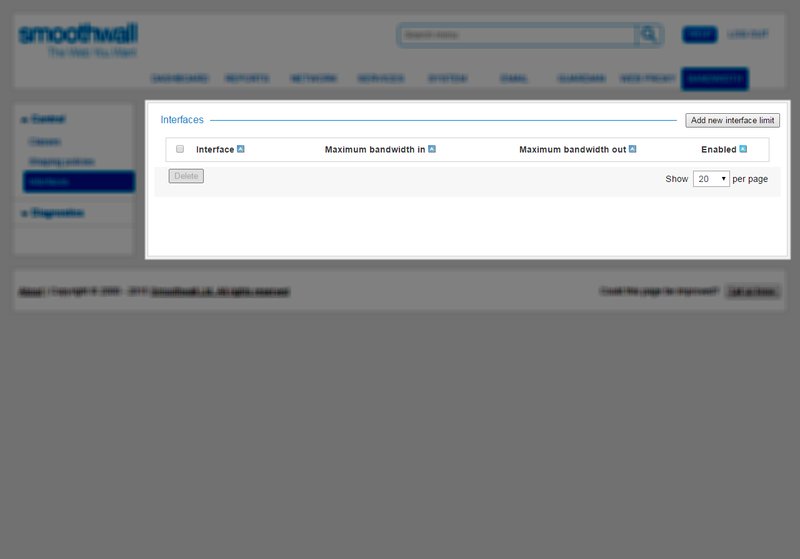 For a detailed description of each setting, see Configuring Bandwidth Interfaces. Note: It is recommended you reconfigure the bandwidth share for each class assigned to the interface if the maximum incoming or outgoing bandwidth has been adjusted for that interface. Typically, you would not need to remove interfaces configured for shaping. However, it should be noted that removing a shaped interface does not remove associated classes from the Bandwidth configuration as they are available to all shaped interfaces. Note: The following procedure does not remove the interface from your Smoothwall, just from the bandwidth shaping configuration. 2. Highlight the relevant class within the Interfaces table, and click Delete. Newly configured classes are automatically assigned a bandwidth limit for each interface configured on the Interfaces page. However, each class is allocated the maximum bandwidth in and out (Use interface limits), with a share type of Dynamic. Note: You can assign a higher allocation to a dynamic, or per user policy, than is configured as the maximum for the shaped interface. This can express the relative importance of classes that are allowed to use the full bandwidth limit. If one class is allocated 200% of the bandwidth to use, and another 100%, both can use up the whole interface bandwidth individually. However, when both are in use at the same time, bandwidth is allocated using a 2:1 ratio.  Dynamic — This is a “best efforts” bandwidth share. A dynamic share is allocated a maximum slice of available bandwidth, however, the total allocated can exceed the maximum available bandwidth. If there is an excessive demand on bandwidth in total for the interface, the quality of service is reduced for all in proportion to their allocation. If you have more than one bandwidth class with a Dynamic share type, the total bandwidth allocated to all classes can also exceed the maximum throughput for the interface. Use the dynamic sharing type to allow classes to use more bandwidth when it is spare, but share fairly when it is in demand. Typical use for a dynamic sharing type would be in a non-critical business or customer environment, such as a hotel lobby, school classrooms, or a company department that does not require guaranteed bandwidth services.  Guaranteed — A guaranteed share is allocated a maximum amount of bandwidth which is guaranteed to the class, and which is not impacted by the performance of any other bandwidth sharing type. You cannot guarantee more than the total bandwidth available. If an allocated class does not use up its share, the remainder is temporarily available to use by other classes which have not reached their limit, but is immediately available should the allocated class require it. Use the guaranteed share type to protect important traffic in the event of excessive demand from other classes. Typical use for a guaranteed sharing type would be a hotel conference room, or a school classroom or company department running video training.  Per user — Each IP address allocated to a class using a Per user bandwidth sharing type, is assigned a maximum bandwidth allocation. The total allocated may be more than the interface’s maximum throughput if all IP addresses were in use at the same time. If there is excessive demand on bandwidth in total for that interface, the available bandwidth for each user is proportionally reduced. Use the per user share type to ensure users receive a fair share of bandwidth, unaffected by the usage of other users in the same class. Typical use for a per user sharing type would be for networks where users are not running critical applications, such as for individual guests at hotels. Bring your own device (BYOD) services are also supported through this policy. 2. From the Interfaces panel, click the expand arrow for the relevant interface to display the Bandwidth shares table. All configured classes are listed. 3. Highlight the relevant class, and click Edit. • Type — From the drop-down list, choose whether this allocation is Dynamic, Guaranteed, or Per user. For more information, see About Bandwidth Share Types. Tip: Very small allocations are unreliable. Around 20 kilobits per second is a practical allocation.